Shiva hours: Sunday following burial until 4:00 and 7:00 to 9:00 p.m., Monday through Wednesday from 2:00 to 4:00 and 7:00 to 9:00 p.m. Evening services at 7:30 p.m.
Ste. Anne’s Hospital Foundation, (514) 457-3440 ext. : 8484, or to Shaar Shalom Congregation, (450) 688-8100. My deepest condolences for your loss. Myer was a special person and will be missed. My thoughts and prayers are with you all. Our deepest condolences to the family on your loss from Judy and Kenny Helfield. Charlotte and Howard Please accept our deepest condolences on the loss of your beloved father&faher-in-law. Dear Charlotte and family. Sincere condolences on the passing of your dear father. Cherish all your wonderful memories. Dera Jon,Ellen & Family, So sorry to hear about your loss. Our thoughts are with you during this sad occasion. Dear Jon, Ellen and Family, Our sincere condolences on your loss. How wonderful that Myer was able to celebrate a milestone birthday with all of you only a short time ago. May your happy memories give you all comfort at this sad time. Charlotte, Our sincere condolences . May the cherished and wonderful memories of your Dad sustain you during this difficult time. Our thoughts are with you and your family. To the Dennick family, extending to you my condolences on the loss of Myer. My memories of him & your Mom were through our connections with the Shaar Shalom while my late husband Fred Sommers was president. May your memories of him, comfort you during this difficult time. My condolences on your loss.May you be comforted with warm memories. Heartfelt condolences to your family. I will remember Myer fondly from the time he was a neighbour to my mother Lois at Ste Anne's. He loved all of you and enjoyed talking about his family. You are very much in my thoughts as you say good-bye to a cherished father and grandfather. We offer our heartfelt condolences to the Dennick Family on the loss of Myer, their Father and Grandfather. We wish to offer to Myer, as well as to his late Wife, Betty, a great tribute for the wonderful people they were. You will always be in our hearts and never forgotten. Dear Charlotte and family, My heartfelt condolences on the passing of your dear dad. Sending you and your family a great big hug. Dear Ellen, Jon and family: My deepest sympathies to you on the very sad loss of your dear father.. grandfather and brother. May His memory be a blessing for you. May he Rest In Peace. My condolences to Lorna whom I remember from grade school. My wife was a volunteer at the Veterans Hospital years ago. Jeff and I wish to offer our deepest condolences on the passing of Myer. He was a much respected and dignified man. His presence has been and will continued to be missed at shul. May you be spared further sorrow. To the Dennick family, David joins me in extending to you all our deepest sympathies. May your treasured memories give you all the strength to carry you through the difficult days ahead. Jon, Ellen and extended family. Thinking of you all at this difficult time. May the wonderful memories of your father that you cherish help to ease your sorrow. Our sincere condolences. So sorry to hear about the loss of your father. What a kind and gentle man. I remember the special friendship my parents had with your mom and dad. My deepest sympathy. We have many wonderful memories of times spent together. May your memories bring you much joy as the time passses. May Myer rest in peace. Dear Dennick Family, My late parents adored your Mom and Dad. Sending you deepest condolences on the loss of your sweet Dad. So very sorry to hear about your father, Lorna. My condolences to you and Howard and the family. Dear Jon and Ellen, Thinking of you at this sad time. May you know no more sorrow. Our deepest condolences on the loss of your father. May your fond memories of him serve as a blessing. Our sincere condolences to the family on the loss of your beloved dad. May your wonderful memories together be a source of great strength at this difficult time. To the Dennick’s family. My deepest condolences on the passing of Myer. A true gentleman. A patriarch to his family. I met him in 1981 after we moved next door to Jon & Ellen. I never saw him get mad. I always enjoyed talking to him. He was a kind man who gave of himself. He was a mensch. He is at peace. B'H Leader and devotee of community and family, aware of G-d's Precious Gifts near to us. A beautiful neshama, tender to all. A Shomer mitzvot and a protector of Zion. with a grateful love of life. A blessed life. Most sincerecondolences to the family of the late Myer Dennick, a good friend , bowler, poker player. Being in his company was always worthwhile-- a man who was not overly verbose, but when he spoke he did have something worthwhile to say. May the family be comforted among all those who mourn in \Zion and Jerusalem. Vickie and John Swidler enjoyed the time we spent with Myer Dennick . He was a friend ,enjoyed his family. We all will miss Myer. He was a true mensh . Let him rest in piece . He will will be missed by his family and friends .He lived a full life and enjoyed every day . Rest in Peace Myer . It is with great sadness that we learn of the passing of your dad. He will always be remembered for his kind spirit and his wittiness. He will surely be missed by all of us. May his soul rest in eternal peace. Dear Charlotte, My sincere condolences to you on the passing of your beloved Dad. You were a very devoted daughter looking after his needs. May you be comforted by the wonderful memories you now have to cherish. We will always remember what a kind and gentle soul your father was. His smile would light up the room when we brought him homemade hamentashen to celebrate Purim. May his memory be a blessing to you and to the entire family. Peacefully, at the Ste. Anne’s Veterans Hospital, on Thursday, April 4, 2019 after recently celebrating his one hundredth birthday. Devoted husband of the late Betty (Horovitz). Beloved father and father-in-law of Charlotte Dennick and Howard Schwartz, Lorna and Howard Kaplan, Jon (Richard) and Ellen Dennick. Cherished “Grandpa” of Jodi, and Cale Ettenberg; Bram and Cassandra Kaplan, Alanna Kaplan and Michael Commisso; Matthew Dennick and Ashley Burko, Jamie and Ainsley Dennick. Proud great-grandpa of Rebecca and Ryan Kaplan; Adrianna and Nicholas Commisso. Dear brother-in-law of Joan Dennick. Predeceased by his siblings and their spouses Hy Dennick, Rose and Israel Letichevsky, and Sarah and Irving Endelman. He will be truly missed by his nieces, nephews, family and friends. Heartfelt thanks to all his loving caregivers and especially the amazing staff on 2A in the Remembrance Pavilion at the Ste. Anne’s Veterans Hospital. Their loving care and support will be forever remembered and appreciated. 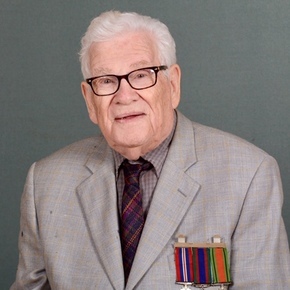 Funeral service from Paperman & Sons, 3888 Jean-Talon St. W., on Sunday, April 7 at 11:00 a.m. Burial at the Hungarian Hebrew Cemetery, de la Savane. Shiva at his son’s home, from 2:00 to 4:00 and 7:00 to 9:00 p.m. through Wednesday evening, April 10. Contributions in his memory may be made to the Ste. Anne’s Hospital Foundation, (514) 457-3440 ext. : 8484, or to Shaar Shalom Congregation, (450) 688-8100.